Jacksonville native daughter, American track and field athlete Chandra Danette Cheeseborough held her 27th annual Chandra Cheeseborough Invitational track meet, Saturday April 1st at Jean Ribault High School. Cheeseborough broke onto the international track scene at age 16 by winning two gold medals at the 1975 Pan American Games, taking the 200m in an American record time of 22.77 seconds. In 1976, she set a World/ American junior record of 11.13 seconds in placing second at the U.S Olympic trials. 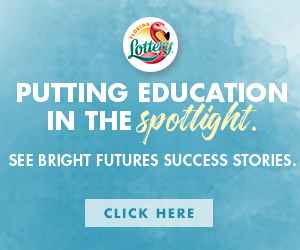 She graduated from Ribault High School in Jacksonville, Florida in 1977, where she set the still standing NFHS national high school records in both the 100 yard (10.3) and 220 yard (23.3) dashes. The coed track meet began with the 4×800 Relay, followed by high jump, shot put, discus, pole vault, huddles and the 100 dash. Over 36 schools participated in the meet. 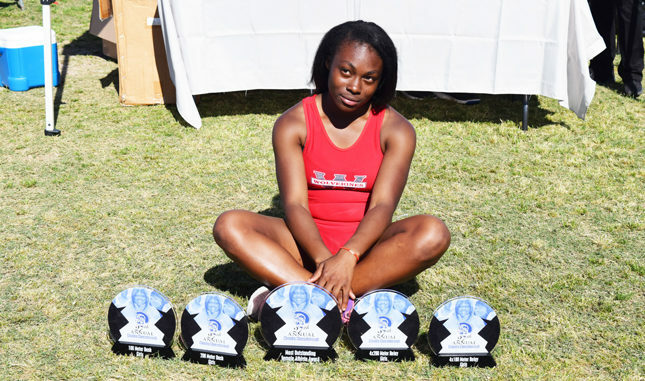 Shown is Westside High Student Aniya Harper showcasing her 1st place 100 meter, 200 meter, 4×1 relay, 4×2 relay and MVP awards.